News : Jon Irigoyen's 'There is always room for more' exhibition 5-18.10. Jon Irigoyen: There is always room for one more. "The first idea that comes to our mind when we speak of tableware is an artifact to serve the food and drink we consume every day. We should, however also be aware of its other, more powerful and symbolic meaning where different social, political, and class values inextricably merge. 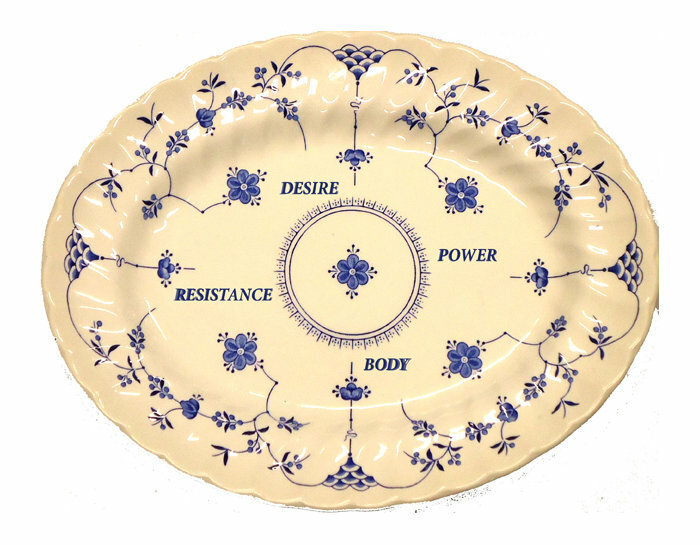 How about creating our own tableware with our symbolic and personal imagery, leaving to our descendants values and images completely different from the ones associated with traditional tableware, with its class, political, and traditional weight? At these times of the postmodern society, few things play as influential role in our lives as consumerism does. Consumption is intimately tied to the creation and production of a sense of self. All objects we consume have a sign class, the creation of our own objects, in this case in a dishware, confronts these dynamics by making a “Do It Yourself” production process. This allows us to break free from the social and family load that we irrevocably carry, by creating our own set of values and beliefs, outside the capitalist and consumerist ones we have been indoctrinated with since our childhood. The words and images I have printed for my new own dishware, are representations of scenes happening all around the South of the World / Europe. They are also my everyday life statement. They show situations of the newly real world and global crisis in places as Brazil, Spain, Italy or Greece, in contrast of the apparent well-being, abundance and ease of the North European countries. In addition, quotes from philosophers such as Michel Foucault, Jean Baudrillard or Franco Berardi in some of the pieces, allow us to understand the real condition of our society. A semio-capitalistic consumer society of control, mass production, biopolitics, simulation… In conclusion, a reality Baudrillard would define as “the desert of the real”.